Attack 1 : Zap of HATE!!! You start to hate yourself after this attack hits you. 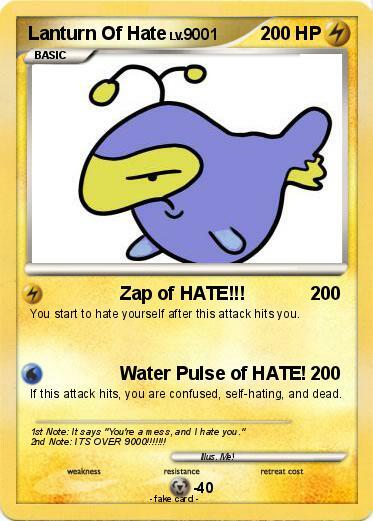 Attack 2 : Water Pulse of HATE! If this attack hits, you are confused, self-hating, and dead. Comments : 1st Note: It says "You're a mess, and I hate you." 2nd Note: ITS OVER 9000!!!!!!! Lanturn | Lanturn | Lanturn | Lanturn | Poe | Lanturn | Lanturn | lanturn ex | Lanturn | lanturn | I HATE JUSTEN BEEVER! | vote if you hate l.a lakers | vote if you hate diego | vote if you hate jb | haters gunna hate | i hate my cards being deleted | if you hate Jake | vote if you hate windows 10 | Lanturn ex | Lanturn | Lanturn | Lanturn | Lampent | Lanturn | Lanturn EX | Lanturn | Lanturn | chica EX | Lanturn | Lanturn | Vote if you hate justin beiber | Lanturn Lv. 43 | Lanturn Lv. 43 | Lanturn lv.58 | Lanturn lv.58 | Team Aquas Lanturn | Club penguin lanturn | Jacob's Lanturn | lanturn | Lanturn | chandelure | Lanturn | Lanturn EX | Lanturn | M Lanturn | Shiny Lanturn | Shiny Lanturn | Green Goblin | Grim Soul | lanturn | Green Lanturn | Green Lanturn | Mistery heart | Lost Soul | groudon hate kyogre | i hate justin bieber | vote if u hate brocoli | Vote if you hate Justin B | TOBI MADARA | Vote of you hate haters gonna hate | evil barney | Vote if u hate JB 1+1 | Vote if you hate lady gaga | Vote if you hate justin! | Vote if you hate justin! | justin ugly beiber | EVIL BARNEY | do you hate justing bieber | justin bieber vote for me if you | Vote if u hate Nick Jr.